You know those fluorescent oranges and yellows and greens that you see every day on traffic cones, safety vests, highlighters, and so on? A hundred years ago, those colors didn't even exist. The Day-Glo Brothers is the story of the guys who invented those colors while they were in their teens and 20s back during the Depression and World War II. Barton clearly and crisply explains how the two young men managed to work together despite the fact that one wanted to be a magician and the other a physician. ... This engaging picture book makes a bright idea stand out even more. 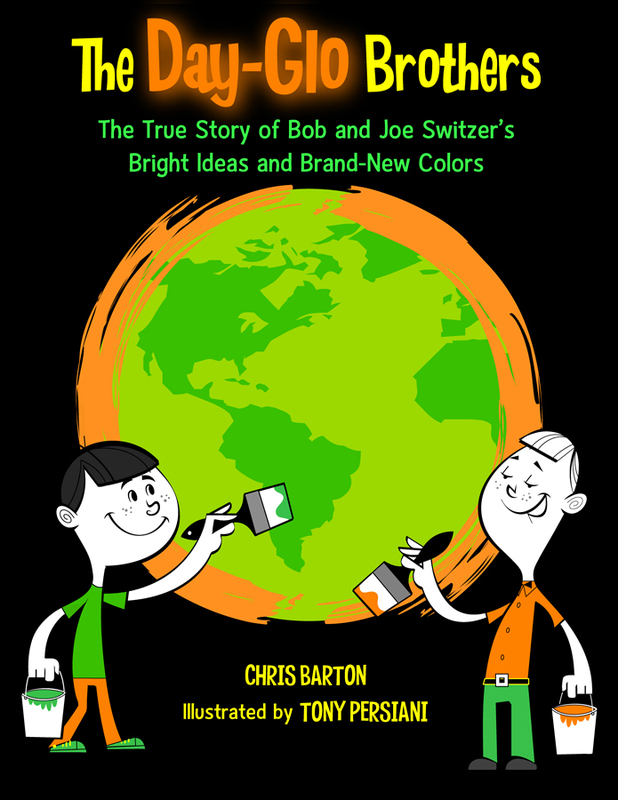 *Starred Review* Barton brings two unknown inventors into the brilliant light they deserve. ... The final pages explode in Day-Glo radiance. Rendered in 1950s-cartoon style ... these two putty-limbed brothers shine even more brightly than the paints and dyes they created. *Starred Review* Barton takes on the dual persona of popular historian and cool science teacher. ... The story is one of quintessentially American ingenuity, with its beguiling combination of imaginative heroes, formidable obstacles, a dash of serendipity and entrepreneurial zeal. *Starred Review* The story is written in clear language and includes whimsical cartoons. ... This unique book does an excellent job of describing an innovative process. Organizing his material well and writing with a sure sense of what will interest children, Barton creates a picture book that celebrates ingenuity and invention. The BookKids Blog! : Chris Barton vs. K.A. Holt: Two Fab Authors, One Fab Saturday, and THIS Amazing Interview! Sulphur Springs News-Telegram Interview: "Stringing words together seemed like the thing to do"